California voters have been duped, defrauded and double-crossed -- twice -- and now they're being fed an outrageously disingenuous lie to cover it up and explain it away. Earlier this month, a judge blocked an attempt by Oakland-based Service Employees International Union-United Healthcare Workers West (SEIU-UHW) to place on the November ballot an initiative that would have limited the pay of non-profit hospital executives. Why did the judge block it? Because it's a bad idea? No. Because it was written incorrectly? No. It's hard to believe, but the courts blocked the ballot initiative because it violated a secretive, collusive arrangement between SEIU-UHW and the California Hospital Association (CHA). In 2014 SEIU-UHW abandoned its watchdog role by agreeing to a gag clause that legally prevented the union and its members from criticizing or filing ballot initiatives "adverse" to the CHA or its member hospitals -- in exchange for unfettered access to non-union healthcare workers throughout the state. Once the CHA signed the agreement, SEIU-UHW abandoned its initiative, which had already qualified for the 2014 ballot. "Ballot box blackmail," the Orange County Register called it. An effort "to harness voters' resentments to advance [the union's] own parochial interests," said the Los Angeles Times. Tens of thousands of SEIU members were powerless to prevent SEIU-UHW President Dave Regan from trading away their rights. Despite a chorus of critics in the media and the labor movement, Regan called the CHA deal "visionary." He didn't see the fallout coming. When SEIU-UHW failed to persuade non-union workers throughout the state to become members, the union retaliated against the CHA by paying millions of dollars to get the initiative back on the ballot. The mess of threatened lawsuits and counter-lawsuits between SEIU-UHW and the CHA quickly spiralled out of control, culminating in Dave Regan's alleged assault on an unsuspecting Contra Costa County process server. California voters are paying the price for the spectacular collapse of this shady backroom deal. More than 600,000 Californians signed petitions to qualify the measure for the ballot in both 2014 and 2016, only to see it snatched away -- once by the union officials who wrote it and now a second time as an unintended consequence of the union's self-penned gag clause. SEIU-UHW officials are now crying foul in an effort to convince voters that they were sincere about the ballot measure in the first place. They're hoping voters will forget that the union abandoned the ballot measure once before and were prepared to abandon it this year if they could have strong-armed the CHA again. 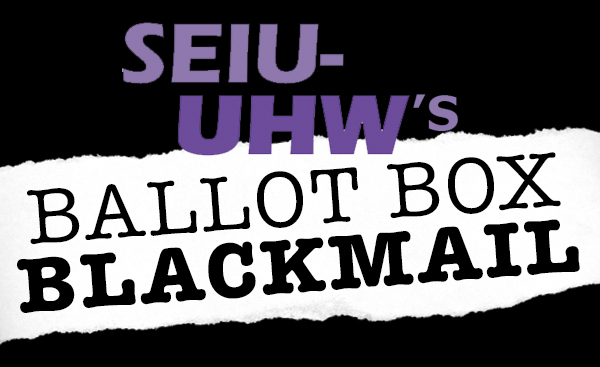 And they hope voters will have short memories two years from now when SEIU-UHW attempts its ballot-box blackmail scheme again. The National Union of Healthcare Workers (NUHW) has been a vocal critic of this scheme right from the start. The house of cards that came crashing down around SEIU-UHW and Dave Regan embodies so much of what is wrong with the labor movement today. Rather than subverting workers' rights, unions should be democratic and member-driven. Rather than engaging in collusive backroom deals, a union should be open and transparent. Rather than tease and betray voters at the ballot box, a union should be forthright and honest. Let's hope Regan and SEIU-UHW learn their lesson and get back to organizing on behalf of healthcare workers rather than hospital executives. Sal Rosselli is president of the National Union of Healthcare Workers, a democratic, member-led union that represents 11,000 healthcare workers throughout California. NUHW.org.